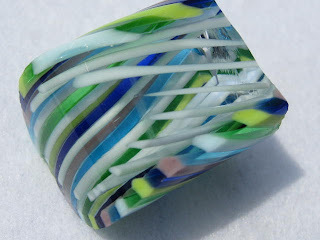 Beaver Island Jewelry: Home again - Caio Italy! 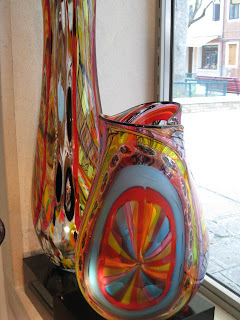 Vases of cane from Massimiliano Schiavon's gallery (see more about his cane below). 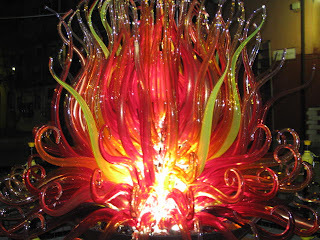 I could have bought one of these, plus a pitcher and six goblets (with shipping) for $4,000 American dollars! 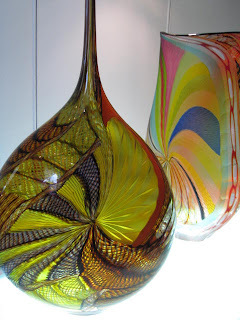 They are beautiful vases but they will have to wait. They send the vases with a light which shines into the vase or behind it to show the beautiful canes. 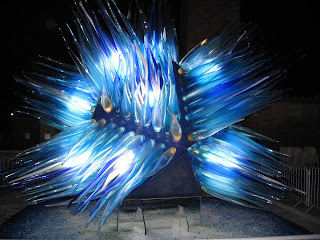 Well, I am back home in Ann Arbor, missing Murano! 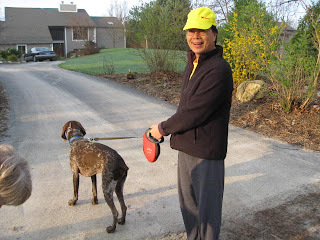 I am back to walking in the morning with my friends. It took a few days for me to get back into Michigan time. I was waking up at 3 a.m. ready to go!! 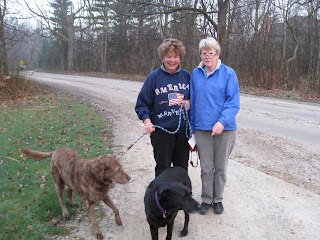 This is Jane and Cleo and me and my dog. 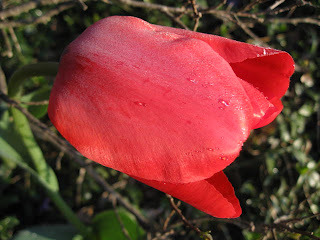 Frosty tulip on April 30, 2008. We had frost and my basil died! I got too excited by the nice warm weather and planted basil which should have waited. 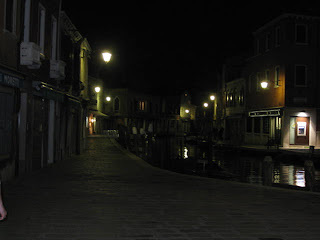 This was the night before I left Murano when we took a "last walk" on the streets. The orange street art on Murano lit up at night. 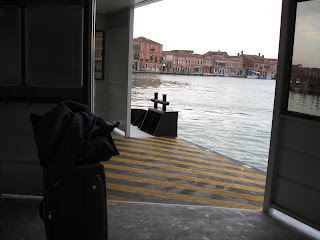 Waiting for the airport boat on the day I left Murano. Kind of dreary out and very sad. 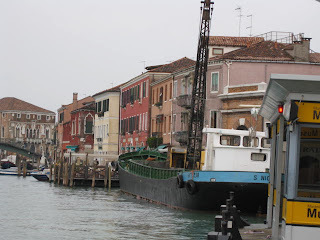 A barge busily working near to the Museo vaporretto stop on my way out of Murano. 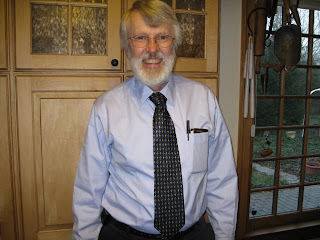 Cary got mixed in Murano photos but when I got home I gave him his new tie from Florence! It has little fleur di lis on it -- and it was maize and blue. Fleur di lis is litterally flower of the lily and is the Florentine symbol. Fleur-de-lis in the coat of arms of Pope Paul VI. 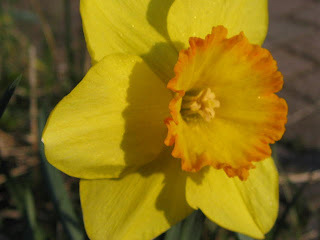 In Florentine, fleurs-de-lis, the stamens are always posed between the petals. This heraldic charge is often known as the Florentine lily to distinguish it from the conventional design. As an emblem of the city, it is therefore found in icons of the bishop Zenobius. The currency of Florence, the fiorino, was decorated with it, and it influenced the appearance and name of the Hungarian fornit and other florins. Elsewhere in Italy, fleurs-de-lis have been used for some papal crowns and coats of arms, andby some doges of Venice. 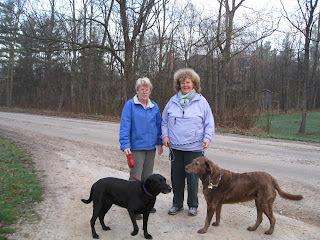 More Ann Arbor photos, mixed in with Murano photos but this is Sandy and Jane. 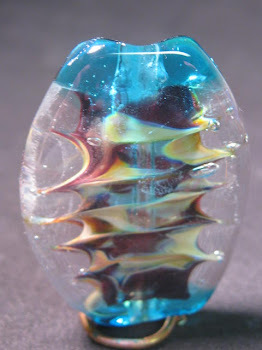 This is cane from Massimiliano Schiavon's glassmaking endeavors. 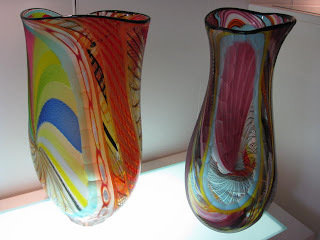 See the photos at the beginning of the blog to see the finished vases. You can see the complexity of the canes here. 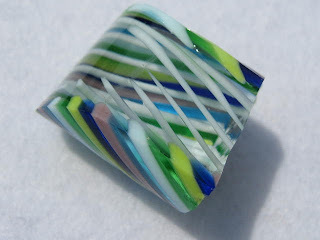 He puts these canes, variously arranged, on transparent glass and then blows the piece. 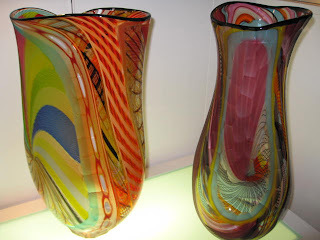 These vases are reminiscent of peacocks' tails and are often very intensively ground out to reveal the layers beneath. See his bead below. 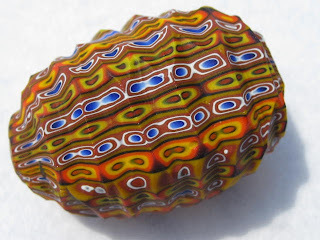 Massimiliano Sciavon's bead which is then cold worked or dug out to reveal the layers of cane. Beautiful! See web site at: http://www.massimilianoschiavon.com/. Kind of hard to see but this was Murano the night before I left when we walked around the deserted streets. The street art is lit up at night and is beautiful! I've been patiently waiting for your "I'm home" blog entry. I thought maybe you missed the boat - on purpose. I've really enjoyed your trip comments and photos. But it is sooo nice that you just want to pop those flowers into the ground!! Yes, I know it is Michigan and we could have frost into June!